The selection of components used to distribute air are critical to achieving an efficient design and imperative to minimize running costs. These are broadly broken into two major areas – ducting and controls. On all return air vents, Crispair only use acoustic line duct which substantially reduces the noise level on the return air vent making the whole system quiter. This is standard on all of our installations. Most of our competitors are using duct with a rating of R0.6. Using fittings with nearly three times the insulation value as our competitors ensures that all our systems are extremely energy efficient. When obtaining different quotes for your air conditioning requirements make sure you check the insulation value of the fittings as once installed it will impact directly on your running costs. On a 35 degree Australian summers day, the roofspace beneath a white Colourbond roof will be 41-45 degrees Celsius. With poorly insulated fittings a lot of your air conditioner units capacity will be lost. The type of controller used is also an important factor when looking at minimizing running costs. On residential installations, Crispair use the Airstream iZone 435 controller. This controller does not require a secondary controller and controls all functions of the air conditioner as well as having the ability to increase or decrease air flow by 5% increments. iZone 435 controllers also give you the ability to have different rooms or zones on different temperatures. This cannot be achieved with standard controllers where the desired temperature is averaged throughout the home from one set point. Call our friendly staff at Crispair for more information or see the iZone 435 in operation in our Balcatta showroom. Presently there is no other controller with the features of the iZone 435 Controller. 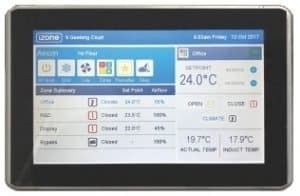 The iZone 435 controller is the only touch screen controller on the market that enables you to control all functions of your Daikin or Panasonic systems as well as full control over airflow and zone selection all in one easy to use colour touch screen panel. The iZone 435 enables you to customise your comfort level. When compared with other options, the iZone 435 controller has many aesthetic and functional advantages over its competitors. Most importantly it is simple to operate and is proudly a West Australian innovation. Experience iZone’s intuitive controls. Discover just how easy it is to achieve home-wide climate control, reduce energy use and save money. Alternatively, please feel free to call into our interactive showroom to see for yourself. For further information on the iZone controller, we have included a brochure here for you to download.